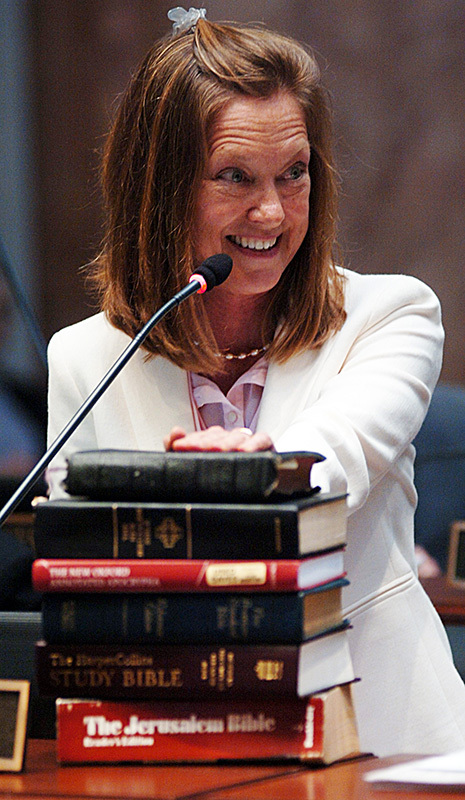 Rep. Kelly Flood, D-Lexington, comments on a bill concerning bible literacy courses in public schools, in the House. Legislative Research Commission. Rep. Tim Moore, R-Elizabethtown, said SB 17 clarifies that liberties granted by the U.S. and state constitutions will not be denied in Kentucky. “We’ve seen in other locales where the clear constitutional right to religious liberty has been imposed upon,” Moore said. “It is right that we in Kentucky make very clear as a body—as our fellows down the hallway have done by an overwhelming bipartisan majority—that we will protect the right to express religious and political viewpoints in public schools and public postsecondary institutions,” said Moore. SB 17 passed the Senate by a vote of 31-3 on Feb. 10. Among those voting against the bill was Rep. Jim Wayne, D-Louisville. “At this time in our nation’s history—when we are experiencing so much division, when we are experiencing so much hatred against Jews, Muslims and whoever else is not in the mainstream—I think we need to be really cautious about bills like this,” he said.